This guest post is thanks to twitter, when someone asked me about pressure cooking eggs. I had never done them, but Laura Pazzaglia had. Laura is a pressure-cooker maniac living in Italy and blogging at hippressurecooking.com. My friend Annie LaG took her up on how to cook easy-peel hard-cooked eggs and pronounced them amazing. I have long been a fan of the egg and recently a fan of the pressure cooker (here’s the one I use, via Opensky.com). I love it especially when I want to have a quick stew ready for a weeknight dinner. A 2 to 4 hour stew can be completed start to finish in under and hour. But the egg and the pressure cooker came together on twitter. I invited Laura to guest post and she eagerly agreed. In fact, she had so much cool stuff to share, and so many fun techniques, I’ll be post a series of her stuff over the next few weeks. Herewith, two great egg techniques, in the shell (she uses an egg stand; this is useful, but optional) and in a vessel. Thanks, Laura. Pressure cookers are famous for their cozy stocks, stews and beans, or infamous, thanks to a chef-testant not being able to open, close or operate a one. There are a few more tricks up your pressure cooker’s sleeve! I’ll start with the ones that caught Michael Ruhlman’s attention on Twitter (fresh easy-peel hard-cooked eggs and eggs en cocotte) and then throw in a few more unexpected things that can come from your pressure cooker. Some use the little-understood low-pressure setting, while others take advantage of accessories or a little technique. Most cookbooks advise using your “oldest” eggs to make them easier to peel. Your pressure cooker creates a pressure difference between the inside and outside of the egg—inflating the little air pocket at the base of the egg and detaching white from the shell with pressure, instead of age and time allowing for a beautifully “boiled” egg that is a snap to peel. Fill the cold pressure cooker with one cup of water. Add steamer basket or trivet and steamer basket, egg stand, and egg. Close and lock the pressure cooker. Set the pan to cook on low pressure. Turn the heat up to high and when the pan has reached LOW pressure, lower the heat to medium and begin your timer: 3 minutes for a soft, 5 minutes for medium egg, and 6 minutes for a hard cooked egg. When the time has elapsed, open the pressure cooker. For soft and medium boiled eggs, use the Quick Cold Water Release. Bring the pressure cooker to the sink and run cold water over the top without obstructing valves to bring the pressure down quickly. For hard boiled eggs, use the Natural Release Method. Move the pressure cooker to a cool burner and wait for the pressure to come down naturally (about 5 minutes). If in 5 minutes the pressure has not released the lock on the pressure cooker, release the rest of the vapor through the valve. Open the pressure cooker and place the egg in a container under cold running water, for about 1 minute if you would like to serve them warm and 3 minutes to cool down completely. 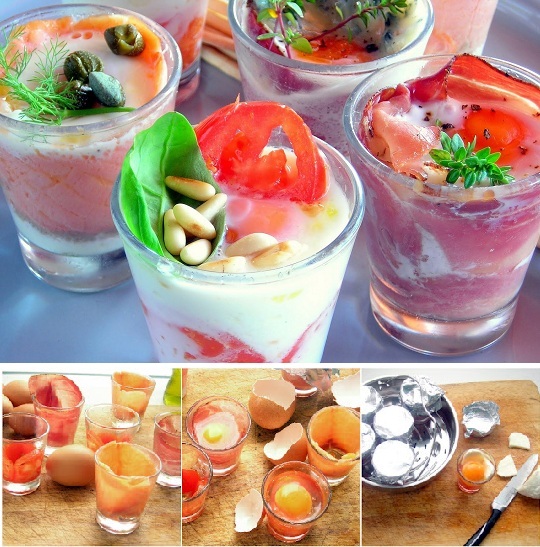 With heat-proof shot glasses (or cups) and pressure steaming you can make a quick and delicious brunch in your pressure cooker. Pressure steam these little tightly covered for a soft yolk, or uncovered for a hard yolk. HOW: With steamer basket and low pressure. Prepare the pressure cooker by adding one cup of water and the trivet and set aside. Add a drop of olive oil in each ramekin and then rub the oil around to coat the inside. Lay a slice of meat or vegetable inside the ramekin. Crack an egg into an un-oiled ramekin and then pour the egg into one with the meat or vegetable. Add cheese or cream on top of the egg. For a soft egg, cover the ramekin tightly with aluminum foil (this keeps the superheated vapor from having direct contact with the egg) and for a hard or fully cooked yolk leave the ramekin uncovered. Put the ramekins in the steamer basket and lower into the pressure cooker. Close and lock the lid. Set the pressure level to low. Turn the heat on the stove up high and when the pan reaches pressure, lower the heat and allow to cook for 4 minutes at low pressure. When time is up, carefully bring your pressure cooker to the sink and open it with the cold water quick release method- run water over the top being careful not to cover or wet any of the valves. For electric pressure cookers, cook at low pressure for just 3 minutes and release pressure using the Normal method-release vapor through the valve. My post and video on Ruhlman’s Twenty: Food as Tools. Pressure cooker video clip from the popular Bravo series Top Chef. Brownie batter pancake recipe sounds great for Valentine’s Day. Something a bit different from our friends at Ideas in Food: Chili and Cornbread Waffles. “hard-cocked” eggs. Love it. I have chickens, and this actually has a meaning for me… That said, I wish a pressure cooker had a place in my tiny Airtstream kitchen! and what meaning would that be? I have 3 roosters and 6 hens (don’t ask! )… the roosters are very *amorous*. And my poor hens are losing the feathers off their backs, literally. I had to make aprons for them to protect their backs from gouging. On the other hand I will have lots of chicks running around soon! A pressure cooker can replace one of your regular pots while not pressure cooking. OR, you can get a teeny weeny one (Kuhn Rikon makes them in all sizes). But…. I have no idea what the pressure cooking time would be for a warm egg straight out of the chicken!!!! Thanks! Love my PCer but some of us have pressure cookers without two pressure levels. My Presto 8qt has only one setting for 15 pounds of pressure. 2 pressure settings (and sometimes three) have been around since the 80’s. But few recipes and descriptions have ever been actually written to take advantage of this setting so some manufacturers began to make cheaper – one pressure cookers.. It depends on your model. If your Presto has a weight-modified pressure valve (it clinks and chugs) you may be able to purchase a lower-weight valve. There is a high-pressure method but it’s not any faster than just doing it on the stove top the old fashioned way – and only produces hard-boiled eggs (mostly with green rings) so I do not recommend it over the traditional method. @catlinvb – T-fal has a Calypso line that I have used for years. Nice heavy bottomed sauce pan and small stock pot, regular lid, and a pressure cooker lid with two pressure settings. I use them daily for cooking and drag out the pressure lid when needed. Would easily do double duty in your Airstream. Laura – thanks for the nudge. Just did Oeufs En Cocotte for breakfast. New tool in my kitchen armory. I have a high-pressure only Fagor, and have made hardboiled eggs in it twice. It’s considerably faster that the old way, and they peel perfectly. The first time I probably left them in the pot for too long after the pressure released and got green edges on the yolks. The second time I cooked for five minutes, turned off the heat and pulled the eggs the second the pressure released. Perfect. One of the six eggs in that batch had a cracked shell, but the egg inside was fine. My mom used a pressure cooker all the time and I’m wondering why I’ve never had one. Maybe too much rhetoric about their ‘explosive’ potential? This alone could change everything. Nothing worse than preparing a dozen hard boiled eggs and having them tear apart while trying to peel them. Does this technique result in better eggs than a pan of water? If not, what’s the point? The advantages of pressure steaming an egg is that they are as easier to peel as hard-boiled old egg- yet without the large “dent” that increases the size of the air pocket with age or any loss in quality that inevitably happens as the egg ages. Peter – they’re not ‘better’ in any taste sense, but they’re better in that every egg literally falls out of the shell. And that’s a big improvement. I’ve always steamed my fresh eggs, but never in a pressure cooker. Takes about 13 minutes to hard cook a large egg. Run under cold water to cool. Crack both ends on the counter. Roll the egg across the counter on it’s side to loosen the rest of the shell, then peel under cold running water. What does this heat proof egg stand look like? Like something that’s not really necessary. I used an aluminum colander with feet. One of those folding petal steamer inserts would work great. Anything that will hold your egg straight and not disintegrate under pressure. I used metal olive oil caps, others have used cookie cutters, aluminum foil rings, etc. I like to use the stand because it helps the yolk remain somewhat centered and also keeps the eggs from rolling around and cracking when you’re moving the pressure cooker to the sink (for the soft and medium boil) – but it is absolutely NOT REQUIRED !! I have never taken mine out of the box, I intended to make a batch of pinquito beans or a bolognese sauce, but this seems much more worthwhile. And I have to share a quick video that I came across of another hero of mine, one that inspired me to attempt my own prosciutto. I have one of those low pressure cookers Gordon Ramsay touts on QVC — is this the same as what you are talking about in a regular PC on low pressure setting? I don’t have confirmation on this (I haven’t seen the manual and I am not in contact with the manufacturer), but someone wrote on the internet that it runs at 7.5PSI – since “low pressure” for a pressure cooker is defined as 6-8 PSI it should work! Come back to let us know! Can’t wait to try this. I especially appreciated the tip on having the pressure indicating button be “hard”. I recently pressure steamed potatoes and it took 3x longer than the recipe said. I think perhaps I didn’t have enough water / heat to get a “hard” pressure, even though the button was up. You also said you pressure cook stock. But in a different post, Ruhlman says to barely simmer, not boil stock. Obviously in a pressure cooker it’s a very hot boil! So I’m wondering if there are downsides to pressure cooked stock? I usually put in a whole chicken, high pressure, take it out in ~10 minutes, strip off the nicely poached meat, then toss in the bones for another 20 minutes. So easy, but maybe not as delicious as the barely simmered kind? It is cloudy for sure. I can’t speak to Ruhlman’s stock technique but, technically a pressure cooker only boils (as we know it with bubbles and turbulence) while it’s coming up to pressure and coming down in pressure. As long as the pressure is maintained there is no additional “boiling” for non-venting spring-valve pressure cookers. For venting pressure cookers (that release puffs of vapor to maintain a certain pressure or jiggle) there is a quick boil after each release as the vapor is building up again to reach the desired pressure. Next time you’re pressure cooking, turn off the heat source and exhaust fan and put your ear near your pressure cooker. In about a minute you will begin to hear the contents “boiling” while the pressure is going down. You might even feel the vibrations by touching the handles! Thanks! I did not know that pressure cookers didn’t boil. I thought since they were hot they must boil, but I guess boiling reflects both temperature and pressure. I think I am going to try comparing a pressure cooked stock and a slow cooked stock! I have an electric pressure cooker with variable pressure settings, however my question involves the use of a trivet or steamer basket. The removable vessel in which ingredients are cooked is non-stick. I realize that there is very little movement inside a pressure cooker, however I’m still concerned about scratches. Am I crazy to think that I could perhaps lay a small thin towel on the bottom to protect the surface then proceed as prescribed?? I recommend silicone steamer baskets for electrics. Wet tea towel may work, though the time to pressure might be increased due to the additional liquid- don’t use a pretty one it might discolor! To measure the pressure attained in a PC, the curious owner could add to the pot some non-food object of known size that would compress in direct proportion to the pressure (but not rebound as pressure was released). Measure it after the cycle and you can compute the pressure it felt. Any idea what might do for such a test? Or would I do as well to take the PC’s temperature somehow (suggestions?) and compute pressure from that? Richard, the best way to measure pressure is to use a wireless remote thermometer (very expensive). However, manufacturers have very clear guidelines they must follow for UL rating (in the US) and pressure cookers designed in Europe must also adhere to CE guidelines – which state that manufacturers must write the maximum safe pressure the top and base of the pressure cooker can maintain when the safety valve kicks in and releases pressure without any warping of the materials. I know from visiting the Fissler factory in Germany that some manufacturers design their cookers to resist even beyond the number they report. There was one guy who’s only job was to test each lid for pressure cookers marked to resist 1bar of pressure (about 15PSI) with 1.5 bars (21PSI) using a special machine. If a lid didn’t pass they were put in the scrap heap to be melted down. I swear by my pressure cooker, but this escapes me. Eggs don’t take any time to cook in the standard manner. They also get tougher when cooked aggressively. Adam, steaming the eggs under pressure is not as violent (or as high in temperature) as in boiling them under pressure. 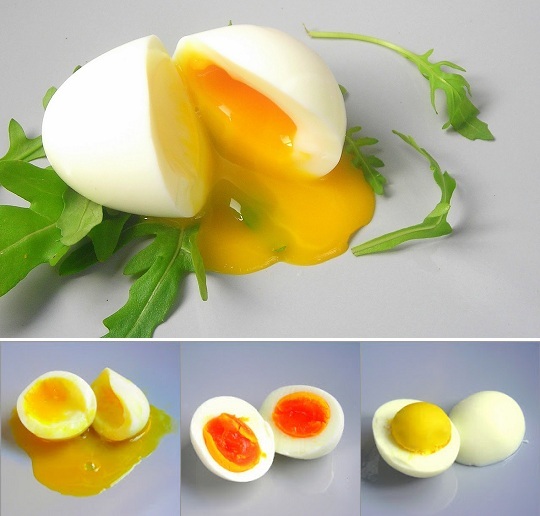 The advantage here, is that you can hard-boil a fresh egg and still have it easy to peel! One of my readers, a cooking instructor (so she knows how to boil eggs), did a test of hard-boiling half a carton of eggs the traditional way, and pressure steaming the other half. Try it, and you’ll see that the eggs won’t be tough OR have green rings around the yolks (a sign of overcooking). I just tried this, with my Fagor pressure cooker, putting the eggs on a metal vegetable steamer, the sort that fan out. The timing was precise for soft-boiled eggs at 3 minutes — and yes, they come out of the shell very easily. More concentrated “egg” flavor? Maybe but I think the quality of your eggs, such as the deep orange yolks you get from pasture-raised hens is more significant in terms of flavor. My cooker though does not have a high or low setting so typically I just turn the flame down as low as it will go, once the hissing starts. While I will probably cook eggs like this again, I think where the cooker really shines is in cooking whole grains such as brown rice, or farro, or as Michael said, with stews. You can get as rich flavors in a pressure cooker in 30 minutes as you can with a long slow 3-hour braise IMHO. You just won’t get the browning, so sear first then pressure cook. Minutes later, I have three soft-boiled eggs. Perfect! And the shells released much more easily than usual. This method is a keeper. There will be more tests…. Thanks for the post! I’ve been a fan of Laura’s writing since I got my pressure cooker for Christmas. I used the blazes out of it, and have now stepped back a bit to regroup and incorporate it in the rest of my kitchen habits. I’ve had these eggs in mind ever since day one – I’d love to get really nicely cooked whites and a very soft, barely-set center. I need to give this a go. I absolutely love all of the posts on pressure cooking on the cooking issues website! If I have more eggs than I know how to pressure cook. I’ll definitely try the egg toast! BUT, I don’t really approve of their Frankin-electric-cooker which was modified to cook at a higher pressure than was designed – bases, lids and materials (like silicone gaskets) are tested to resist particular pressures and temperatures and it’s just not a very good idea to go beyond it. Would love to see your egg toasts!! amazing, I would never imagine one could do it without immediately over-cooking the yolk. Just did hard boiled eggs in my Fagor Splendid 10 qt. It only has the high pressure setting. I looked in the book that came with it and noted that times for high pressure for things like potatoes seemed to be half that for low pressure. Based on the information in the book, I decided to halve the cooking time from 6 minutes to 3 minutes. The rest as per your instructions. The result was perfect hard cooked eggs that peeled very easily. I am a convert to this method. My first batch was 2 eggs. I am doing 14 eggs for my second batch right now. I am SO in love with this method. Had to give you input – I follow this blog daily and this post pushed me over the edge from just curious about pressure cooking to wanting a cooker NOW! I surfed like crazy. Decided I liked the idea of electric but wanted to see Kuhn Rikon and Fagors. Went to Sur La Table and fell in love with the All Clad Electric pressure cooker! I’ve used it 4 times in 5 days and am amazed! Awesome new toy and hoping we’ll see more Ruhlman input on pressure cooking! Thanks for all you do! I did this in my Cuisinart electric pressure cooker. I found 3 minutes @ low in it gave me fully cooked eggs and I needed to do 2 minutes for soft eggs. Pressure cookers are by far not a new invention, but with improved technology they have become safer and easier to use than ever. My family love soup. Homemade soup is delicious and perfect in the winter months, but nothing is worse than waiting hours upon hours for your masterpiece to be complete and ready to eat. Even worse, soups are generally better the next day, giving you even longer to wait.